Invite agents to conduct business with you on Vacation Labs. Share your rates & inventory with them real-time. Allow them to focus on marketing your tours instead of getting involved in operational hassles. Quickly organise your pricing across channels with multiple “rate cards“. 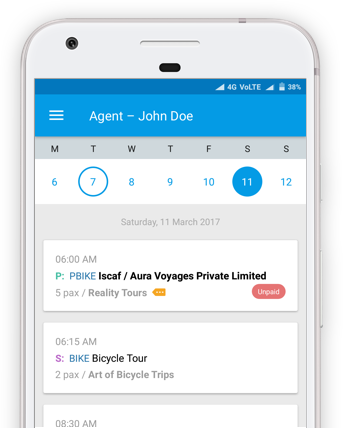 Control which tours are shared with which agents, at what rates/commissions. For example, share higher commissions with agents that drive more sales for you. Or share tours with Russian speaking guides with agents in Russia. You decide, you control. Sell indirectly, but communicate directly. Make sure you deliver the same information to all your customers, irrespective of whether they booked directly with you, or through an agent. The pickup time, meeting point, what to bring along, tour guide details – everything. Avoid last minute panic-calls between the customer, the agent, and you. The agent is credited for the sale (and even mentioned in the confirmation email to avoid confusion), but you control the communication. It’s that simple. Don’t go crazy reconciling your accounts with agents. Let us do the heavy lifting instead. Get detailed and summarised reports about who collected the money from the customer (you, or the agent); how much commission was earned; and finally how much you need to pay the agent (or the other way round!) to settle the accounts. Agent on-the-go? There’s an app for that! Allow agents to view real-time inventory & rates even when they’re on-the-go. With agent logins that work on the desktop and the mobile, your agents can stop chasing you for seat availability and latest prices. One less headache for them, and one less headache for you. Give a boost to your sales! Start selling your tours on leading marketplaces.